It is believed that St Ninian was the first person to Introduce Christianity to Aberdeenshire around 396/7 AD. One of his disciples, St Ternan, is said to have undertaken missions to Belhelvie. The earliest recorded reference to Belhelvie is 1157 addressed to Bishop Edward from Pope Adrian IV. Most of the surviving written sources for Belhelvie parish date from the end of the sixteenth and start of the seventeenth centuries. The Session Book belonging to the kirk dates from 1623 and the register of baptisms from 1627. In 1876 the heritors of the parish submitted plans for a new kirk in Belhelvie. Mr Lumsden donated the land and local tradesmen undertook the mason and carpentry work. 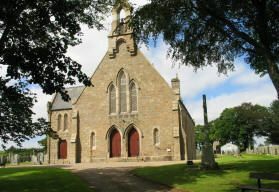 The present kirk, Belhelvie North at Drumhead as it was known was completed in 1878 at a cost of £3150, slightly over the original £2622.11 estimate. A famous forebear, the Reverend Alexander Forsyth, who between 1805 and 1807 invented the percussion lock for firearms, used the anvil that stands in the vestibule of Belhelvie Church. A plaque commemorating his achievement is displayed in the Tower of London and also Kings College Aberdeen. Belhelvie North Kirk was refurbished in the 1960’s and The Forsyth Hall was erected in 2000, next to the new manse, behind the church. Further information available in leaflets within the church premises.